Early Friday morning, August 17, 2018, N9BM-J (“Giggles”) gave birth to a pinto colt. The new foal, N9BM-JQ, and band live most of the year in the very busy developed area and campgrounds. For this reason, the National Park Service expressly reminds visitors that it is essential to remain a minimum of a bus length (40 ft) away from the wild horses at all times. Everything is new to a foal. N9BM-JQ will learn how to interact with the environment from Giggles and other members of his band. 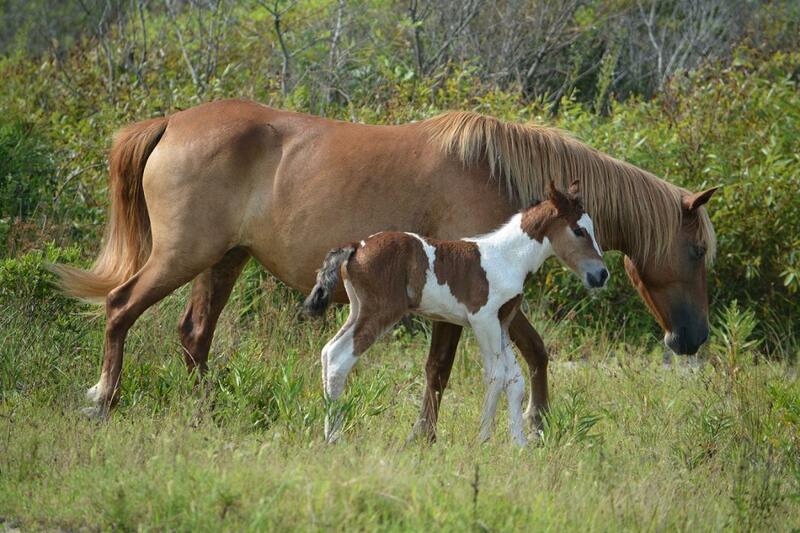 About two-thirds of foals in the National Seashore are born in April, May and June, but it is not uncommon for foals to be born during any month of the year. A mare will be very protective of her new foal and it is vitally important for their well-being that visitors give them, and all of the wild horses, plenty of space.